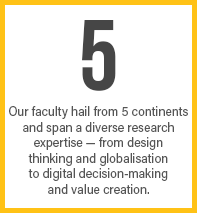 Leading in Innovation, Research & Academic Excellence – SP Jain’s faculty are more than just forerunners in their areas of learning and expertise. They are the academic strength that nurtures the future leaders of the world. 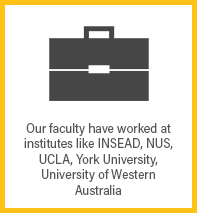 Our faculty gains its global reputation for more than just their revolutionary transformation within their industry; it is also for the integral contributions they make to the ever-evolving business practices across the world. 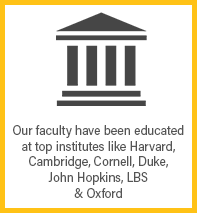 The faculty at SP Jain are active partners within businesses across the world that help them shape the curriculum and teaching methodologies to best suit the demands of the corporate world. 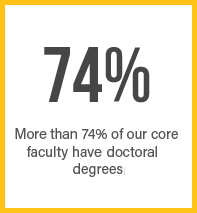 The diversity of our faculty adds value that exceeds academic excellence. Their multinational experiences, cultural sensitivities and social presence helps us create a learning environment that is rich, friendly, supportive and conducive of growth. i2i is SP Jain's newest innovation -- a centre for research, education and consulting in global innovation management. Our mission is to help people innovate and create insights, and we do this in a collaborative fashion, seeing "eye to eye". Our new insight program, DESIGN THINKING FOR INSIGHT INNOVATION, provides participants with hands-on experience using design thinking, the concrete approach to innovation pioneered by the celebrated design consultancy IDEO. The program helps people break through barriers in business growth by redefining their challenges and opportunities, observing customers, framing and generating ideas more effectively, and creating business experiments to test out ideas and assumptions before spending big budgets on development. We also help our participants tap into our mentorship community for ongoing coaching, consulting, and friendly advice, as well as access to partner organisations, which include research partner Innosights, open innovation partner AIA, event partner Infosys, accelerators, venture capitalists, entrepreneurs and more. The Centre is led by Dr. CJ Meadows.